New to the Archive: Bungalows of Far Rockaway! Diamonstein-Spielvogel! SoHo! Ladies’ Mile! Preservationist Richard George recently donated materials associated with Far Rockaway to the Queens Library Archives. The Rockaways are the various communities that make up the 11-mile long Rockaway Peninsula on the southern border of Queens. 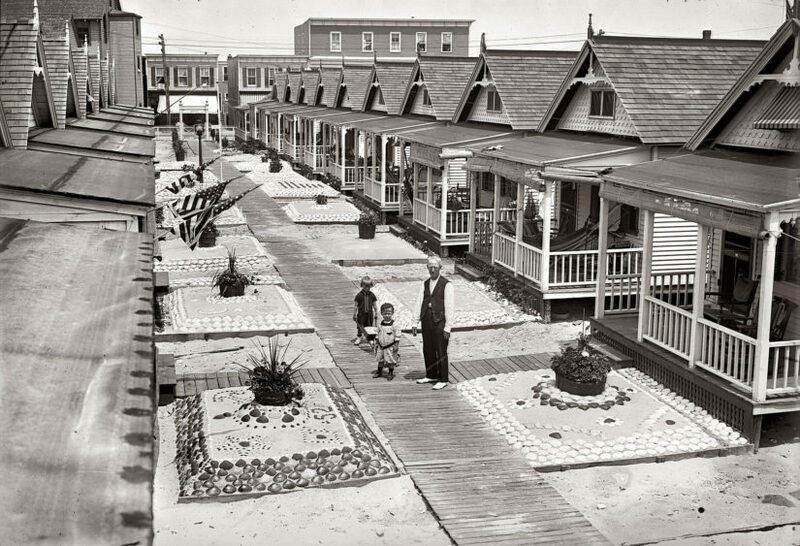 With the Atlantic Ocean to the south and Jamaica Bay to the north, a vital middle class beachfront community developed here in the early-twentieth-century, characterized by small bungalows constructed for rental and sale primarily to summer residents of Jewish and Irish heritage. With the advent of inexpensive travel and air-conditioning, the Rockaways ceased to be a popular destination for vacationers after World War II. The development of nursing homes and public housing projects created a burden for the local economy, and with budget cuts to city services, the neighborhood became blighted over the subsequent decades. Although at one point there were over 7,000 bungalows in the area, fewer than 500 now survive. Neighborhood residents Betzie Parker White, Roger White, and Carole Lewis formed the Beachside Bungalow Preservation Association of Far Rockaway (BBPA) in September 1984. The purpose of the organization is to improve the quality of life in Far Rockaway through neighborhood improvements, educational and cultural programs, and preservation of the bungalows as a reminder of the area’s history. Richard George initially became involved with BBPA when he purchased one of these bungalows in 1986 and viewed firsthand the degradation of the community. He joined the BBPA to help combat many of the issues plaguing the area and to preserve the rare and endangered bungalow structures. He became chairman of BBPA in 1990 and with the help of concerned residents secured a $30,000 grant from the New York Foundation, a supporter of community-initiated resolutions to solve local problems in New York City neighborhoods. This grant helped BBPA to set up an office, hire two employees, and organize programs for the community. The activities of this more formalized BBPA have included the production of a quarterly newsletter, area cleanup, the establishment of a community garden, an annual art and culture street fair, a summer fine arts course, a youth baseball league, emergency food programs, and a neighborhood watch. A notable achievement was the 2008 rezoning of the neighborhood to match the height and scale of the original bungalows. More recently, much attention has been garnered for the preservation of the area’s historic architecture with the help of a 2010 independent documentary entitled The Bungalows of Rockaway. In 2012 the Far Rockaway beachside bungalows were selected by the Historic Districts Council as part of their “Six to Celebrate” program, which identifies six historic New York City neighborhoods that merit preservation. With this annual initiative, the Historic Districts Council provides these neighborhoods with strategic help throughout the year to accomplish preservation goals. The BBPA records donated by Richard George are varied and include artwork, correspondence, DVDs, financial records, maps, newspaper clippings, photographs, and advocacy posters. Together these materials tell the 30-year history of a small neighborhood organization that continues to fight for the preservation of the buildings that make its area special. The Archive Project is delighted that this collection has been successfully archived at Queens Library, where the records will be available in perpetuity to researchers and other interested parties. If you have questions about this collection, please contact the Queens Library Archives at 718-990-0770. The Neighborhood Preservation Center (NPC) recently contacted the Archive Project for assistance in placing three boxes of significant materials at the proper archival repository. These boxes, filled with papers from two noteworthy New York City preservationists, were acquired by the NPC years ago and have since been held there until an appropriate home could be found. Two of these boxes contain papers from Barbaralee Diamonstein-Spielvogel’s term as a Landmarks Preservation Commissioner (1972-87). This collection includes a vast array of internal documents, personal notes, and correspondence, with information on public hearings, drafts of designation reports, documentation on prospective landmarks, maps, articles, and calendars. The third box holds papers from Adriana Kleiman, who received her master’s degree in city planning from the University of Pennsylvania in 1962 and was employed soon after by the New York City Planning Commission. The Kleiman materials include documentation on the rezoning of SoHo and the promotion of the neighborhood as a cultural district. Included are newspaper clippings, notes, letters of support from various organizations, correspondence, maps, plans, and residential statistics. Most provocative is the first-hand rezoning data collected from the artists and residents inhabiting the repurposed SoHo loft spaces. The Diamonstein-Spielvogel collection is now housed at the Landmarks Preservation Commission’s on-site archives and the Kleiman materials found a home at the venerable New York Public Library, joining other materials on the history of SoHo in the library’s archives. Another fortunate archival union has been created for Jack Taylor’s and Peg Moore’s collections on the battle to protect Ladies’ Mile. The Ladies’ Mile Historic District was designated in May 1989, but only after a concerted campaign by these two figures and others. Fortunately, both preservationists maintained impressive personal collections on the effort, including slideshows, advocacy buttons, pamphlets, photographs, historic research, letters of support from influential New Yorkers, and much more. The New-York Historical Society, which is actively expanding its 20th century collections, was thrilled to acquire these important historical records to enhance their current holdings. Gathering and preserving papers such as these and finding them secure homes at permanent collecting institutions is an indispensible part of the Archive Project’s mission. Even small pieces of New York City’s preservation story, when collected and made accessible, have the power to educate and inspire those engaged in the preservation arena.